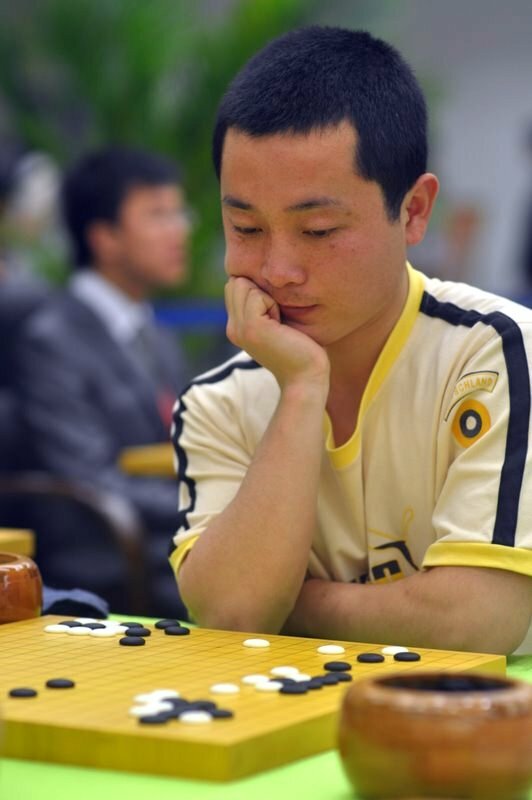 Fifteen minutes before the start of Round 3 on May 13, Qiao Zhijian, the main Chinese contestant, was already seated at his board…Click here for Ranka Online’s report on the round. The fourth-round contest between the US and Japan turned into a controversial and dramatic slugfest involving a series of severe attacks, both players in overtime, a key losing move in the late middle-game, a ko fight with both players in their last period of overtime and a sudden loss by Japan on time, complicated by a clock dispute that went all the way up to the tournament’s chief referee. See So Yokoku 8P’s commentary on the game to see what all the excitement was about. Click here for Ranka Online’s complete reports on Rounds 3 and 4 (including a more detailed report on the US-Japan game), here for the latest results and here for Round 3 game records and Round 4 game records. Daniel Smith 2d took top honors at the May 12 “It Was 20 Years Ago Today” tournament in Chicago, IL. Not a Beatles song reference, the title refered to this being the 20th anniversary — to the month — of Tournament Director Bob Barber’s (at right, at work) first tournament. 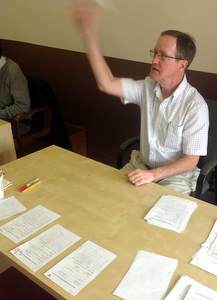 This was the indefatiguable organizer’s 70th imaginatively-named competition and the 65-year-old — who claims to have “never lost even a single game” at one of his tournaments — says he plans to keep going “for at least another 20 years.” He also noted that three people who played in his first event two decades ago were there this time as well: Ian Feldman, David Rockwell, and Chris Greene. “Greene is also the publisher of Hinoki Press, which generously donates a book to each player at Chicago tournaments,” Barber said. 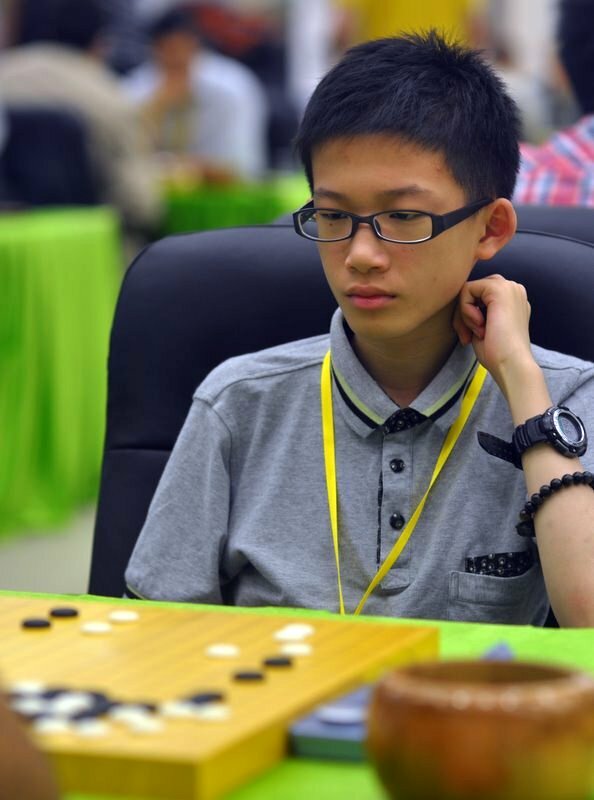 Despite a good opening, the United States’ Yuan Zhou 7d became the second seeded player to suffer defeat when he lost to 13-year-old Chen Cheng-Hsun 7d (at left) of Taipei in just 152 moves. “I wasn’t prepared to play such a tough player on the first day,” Zhou confided to the E-Journal. “But it’s great to see such strong young players.” When Cheng-Hsun competed in the WAGC in Hangzhou in 2010 he was thinking of going directly from primary school into a professional career. Instead, he took the more normal course of entering middle school, but his playing strength has continued to improve and he would already be serious competition for a lot of professionals. The game between Nadeem Prem 3d (Brazil) and Leslie Perez 4k (Chile, at right) developed into a contest worth watching, despite the wide disparity in listed rankings. 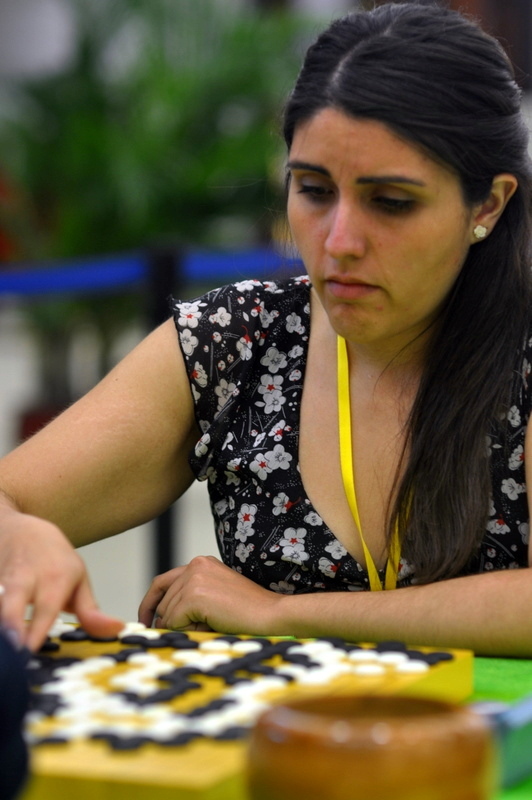 Overcoming the six-stone ranking difference, Perez won handily by 17.5 points to score the tournament’s first win by a woman; her Chinese counterpart, Fang Xiaoyan, the tournament’s only other female player, had already lost her second-round game to Andreas Gotzfried of Luxembourg. In the Czechia-Germany game, Czechia (Lukas Podepera) launched a fierce attack on a large German group, forcing it to struggle for a minimal life with just two eyes, and kept the pressure up relentlessly until Germany (Benjamin Teuber) resigned. Ten minutes later, Slovenia (Matoh Leon 5d) prevailed over Argentina (Eduardo Lopez Herrero 5d). The winners of these two games will meet in Round 3. 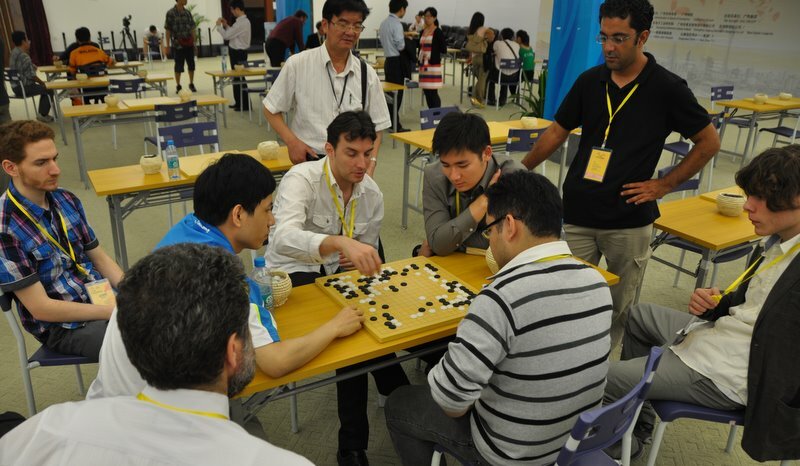 The World Amateur Go Championship games are played with basic time of one hour per player, followed by thirty-seconds-per move overtime, each player having three thirty-second periods to use. In Round 1 on Sunday morning, among the four seeded players, Qiao Zhijian (China), Lee Hyunjoon (Korea), and Yuan Zhou (U.S.A.) won handily, but Remi Campagnie (France) was upended by Pavol Lisy (Slovakia). This was a come-from-behind victory. ‘I was losing,’ Pavol said, ‘but my opponent made a big mistake, and after that I was winning.’ It was not an upset, however: both players are ranked 5-dan. In the other battles of the 5-dans, Leon Matoh (Slovenia) defeated Igor Popov (Russia), Lukas Podpera (Czechia) won a close 2.5-point victory over Longyang Li (New Zealand), and Eduardo Lopez (Argentina) prevailed over Martin Li (Sweden) by 8.5 points. The two youngest contestants both won their games, Chen Cheng-Hsun (Chinese Taipei) beating Carlos Acuna (Colombia) and Chan Chihin (Hong Kong) beating Felicien Mazille (Switzerland). 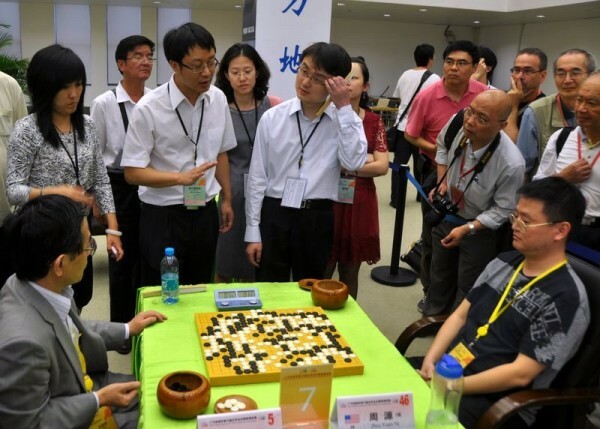 Nakazono Seizo (Japan) won by a comfortable margin against Saechen Panjawat (Thailand), and in a very short game, Ri Kwang Hyok (DPR Korea) defeated Fang Xiaoyan (the second Chinese player). Chan Kouk Wang (Macau) won by forfeit when Ismail Ja (Morocco) failed to show up. Last to end was the game between Pal Balogh (Hungary, 6d) and Andreas Gotzfried (Luxembourg, 4d). ‘I thought it was about even through the middle game, but I lost a lot of points in the endgame,’ Andreas said. He had turned in a creditable performance, against one of the strongest players in Europe. DPR Korea-China (Commentary by So Yokoku 8P); Thailand-Japan (Commentary by Yang Shuang 3P); US-Norway (uncommented); Brazil-Korea (uncommented). The 33rd edition of the World Amateur Go Championships (WAGC) began Sunday morning, May 13, in the gold-draped main playing hall of the Guangzhou Chess Institute (“chess” in this context refers to go, chess and Chinese Chess) in Guangzhou, also known as Canton, the capital city of Guangdong Province in South China. Fifty-six players (Poland’s player missed his plane and has been replaced with a second Chinese player) have traveled from around the world to compete for the title as world’s top amateur. 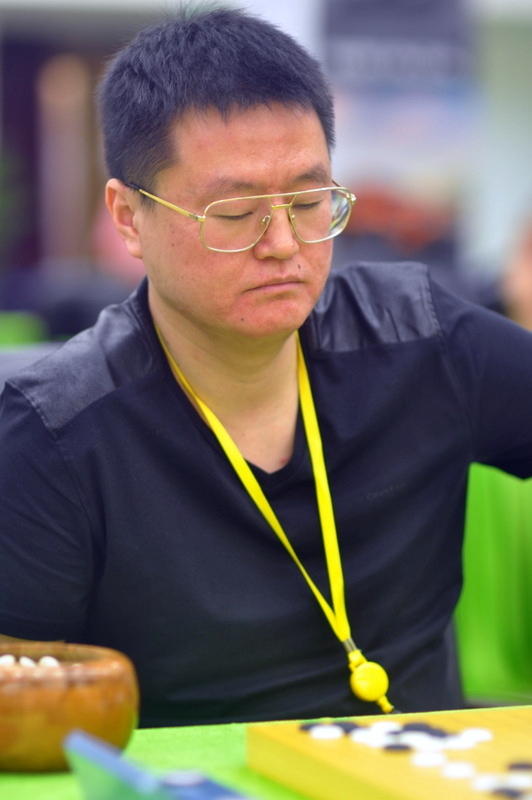 While China and Korea are once again favorites to win, the U.S. last year cracked the top five with Eric Lui’s 3rd-place finish and is represented this year by Yuan Zhou 7d, the popular teacher and author who’s won a number of U.S. titles. The American Go E-Journal and Ranka Online have teamed up again this year to provide full coverage of the WAGC, including tournament reports, game records and commentaries and photos; reports will be posted regularly on the AGA’s website, at Ranka Online and in the daily E-Journal. The 8-round tournament runs May 13-16. 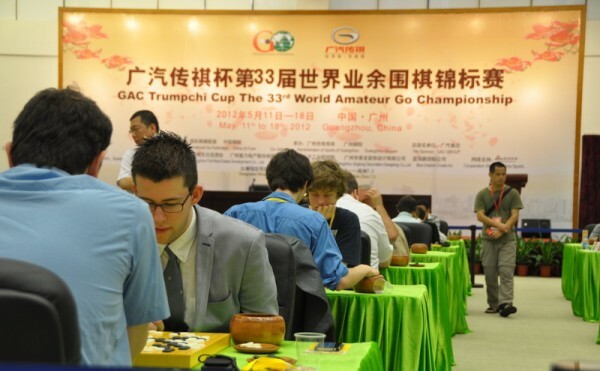 By 2:35 p.m. on Saturday, May 12, most of the contestants in the 33rd World Amateur Go Championship had made a good start on recovering from jetlag, had sampled the breakfast and lunch buffets at Guangzhou’s Baiyun Hotel, and were ready for the orientation meeting. The meeting opened with an address by chief referee Hua Yigang 8P, who described go as a sport, an art, and a good platform for communication, and noted that east or west, Canton cuisine is the best. 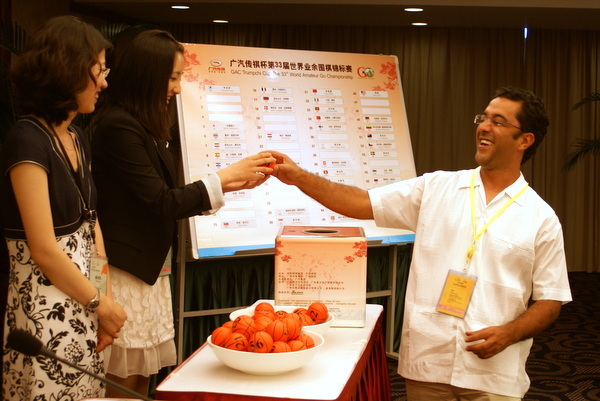 Executive chief referee Liu Jing 8P then went over the tournament rules and the computerized pairing system, which were the same as used in Hangzhou in 2010, and announced that since only 55 contestants were coming, an extra Chinese player had been added to make an even number. Next came the main business, which was to draw the numbers that the computer would use in determining the pairings throughout the tournament…click here for Ranka Online’s complete report. Next up in the TYGEMGO Pro Prelim series is the Baltimore Go Club’s 39th Maryland Open on May 26-27 in Catonsville Maryland just outside Baltimore. The top finishing player with qualifying citizenship earns the right to compete for pro certification this summer in North Carolina the week before the US Go Congress. Top players also earn points to represent the US in the World MindSport Games in France. “However,” stresses local organizer Keith Arnold, “ALL players of ALL strengths are welcome to play and be present for this historic event.” Click here to pre-register or contact Keith Arnold at hlime81@comcast.net with any questions.